Rep. Mark Meadows (R-NC) called for Deputy Attorney General Rod Rosenstein to step down Thursday over his lack of transparency and candor with Congress. Meadows blasted Rosenstein on Twitter for his "characterization of events" and his willingness to speak with the Wall Street Journal but missing a meeting with Congress last week. "Based on additional information we've learned over the last week, it is clear Rod Rosenstein should resign immediately," he wrote. 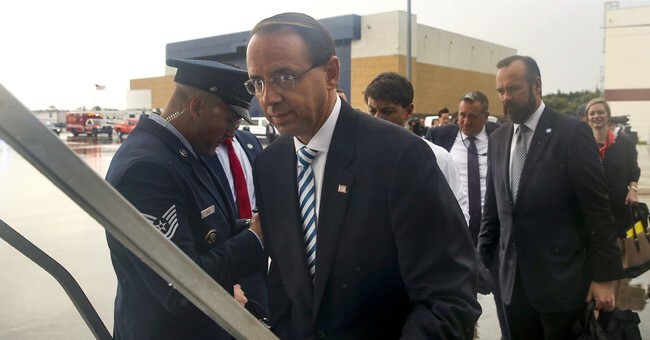 Rosenstein had been scheduled to meet with Republican lawmakers last week in order to answer questions regarding reports that he had planned to wear a wire to secretly record President Trump in the spring of 2017. Meadows participated in a House interview Thursday with FBI lawyer James Baker regarding these reports. Rosenstein reportedly claimed his comments were attempts at sarcasm but several GOP lawmakers have threatened to subpoena him.